What's Random Friday, you ask? You've never heard of it? Well that's because its a new meme created and hosted by the wonderful girls at, Ezine of a Random Girl! The thing about Random Friday, is that there's no "format" or exact way you should write it (unless otherwise specified). 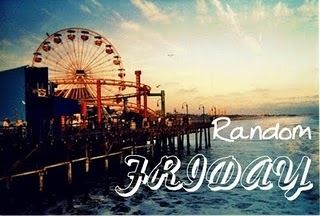 But most importantly, the whole point of Random Friday is that they give us the topic and whatever pops into your head right after you read the topic for the week, is what you write down. What five books have motivated you to read more and made you interested in reading? What book has the most tragic/saddest or bravest scene you've ever read? I think it would have to be "My Soul to Lose" By Rachel Vincent, because when Kaylee is sent to the psych ward and her aunt and uncle don't come for her and she feels alone and abandoned i lost it. I cried my eyes out like a baby, because all i could think about is what if that happened to me? And also i had a friend named Kaylee and her parents used to threaten to send her to a psych ward, because she really was suicidal and she did end up committing suicide so all those coincidences together made me lose it again. I forgot to comment on this last Friday! I'm sorry! But just so you know, you're awesome. Do you know that? Wow! really nice answers! Your blog is really interesting... Thanks for joining our meme!!! PS: New Follower! Ha, thank you so much! Thank you very much and you're welcome i think this is a great meme idea!